The first step in using SimpliRoute is creating new users in the platform. 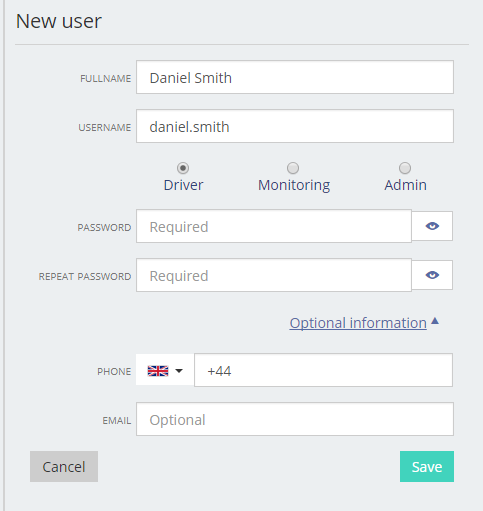 Users can be of the administrator, monitor or driver types. 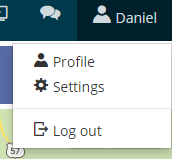 To create a user, click on your username in the top right corner of the interface and click on Settings. In the Settings menu, click on Users > New User. Name: Here, use of full names is recommended, as in "Jaime Uribe". User: Usernames are meant to be unique in our database and repeated usernames are not allowed. This is the username the specific user will use to log into the mobile app. Password: This is the password used by Administrator and Monitor users to log into the web platform and the password used by Drivers to log into the mobile app. Administrators: Administrators are allowed to use the entirety of the interface, with permissions to create routes, drivers and visits, monitoring of activities, and download reports. Drivers: Drivers are only allowed to access the mobile app. They will be able to see their assigned routes and programmed visit information, as well as report any feedback on visits. Monitors: Monitors are only allowed to monitor visits; they do not have permission to configure or create new routes. Monitors are also barred from downloading reports.